The focal point of this lecture is the Spinal Cord Development. Section one elucidates the Neural Tube Formation. In the beginning, the educator has put forth an Overview. Along with this, the process of Neurulation has been extensively described. This section concluded when the educator talked about the process of Formation of Neural Tube, in detail. Section two emphasizes on the Neural Crest Cells and Ectodermal Placodes. Firstly, Formation of Neural Crest Cells has been delineated. 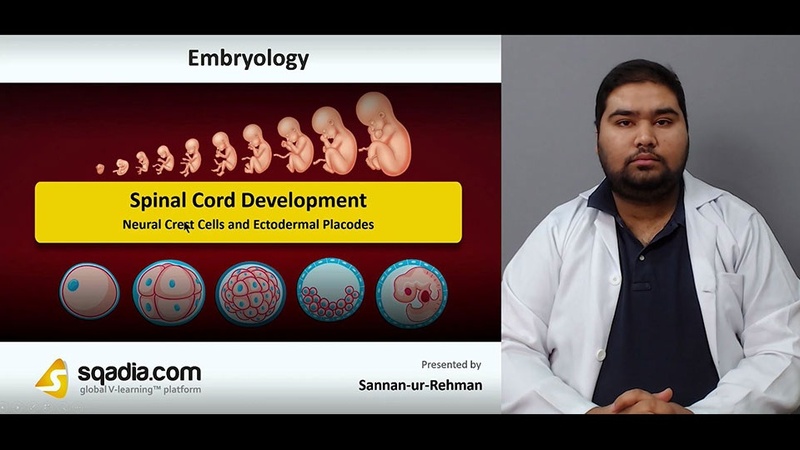 Next in line, Formation of Ectodermal Placodes and Anencephaly has been shed light on. In the end, the educator has comprehensively conversed about a condition termed Rachischisis. Section three lays stress on the process of Histogenesis of Neural Tube. At the start, Development of Spinal Cord has been brought into deliberation. Following this, Histogenesis of Neural Tube has been thoroughly communicated. Alongside this, Old and Current Theory of Development has been reported. Conclusively, the Histogenesis of Neural Tube has been presented. The objective of section four is the Development of Functional Columns. Initially, the educator expounded Dorsal and Ventral Walls of Neural Tube. Succeeding this, Lateral Walls of Neural Tube and Development of Functional Columns has been brought into discussion. In the end, the educator summed up by debating about the Columns of Alar Lamina along with the Columns of Basal Lamina. The key focus of section five is on the Positional Changes of Spinal Cord. Primarily, the positional changes At Week 8 and At Week 24 has been shed light on. Moreover, At Birth and in Adults these changes have been presented. In the end, the educator winded up by speaking about Cauda Equina.